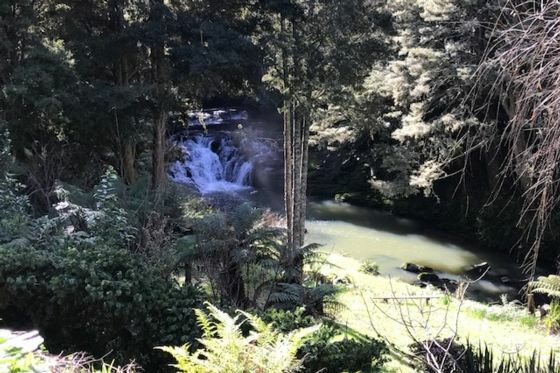 How many places in New Zealand, or even the world, can offer your own private universe for two overlooking a stunning waterfall set in its own natural amphitheatre? The Waterfall Hideaway is a romantic oasis where you can escape it all, relax and read in the sun, barbecue the day away, listen to music or just enjoy the soothing sounds of the waterfall. And if you should happen to venture out, Matakana's famous vineyards, farmer's market, sculpture trails and countless beautiful beaches await. We have a no parties rule. If any items of or in the property are broken or damaged by the guests the guests are to pay for repair or replacement. Few minutes drive to Matakana, Warkworth and close to many beaches. Great little place, very peaceful and homely. Very close to neighboring towns and beaches. Kim was lovely to deal with. Would definitely stay again. We had a very restful time at the Waterfall Hideaway which was exactly what we needed. The hideaway is situated in lovely surroundings and the property was very clean . There was everything there that we needed and it was close to Matakana. The owners were very discrete and helpful. We would definitely visit again. Thank you Sam. Would love to have you stay again!